Wisconsin Distracted Driving Accidents | Hupy and Abraham, S.C.
Thousands of people are killed and tens of thousands of people are injured in distracted driving accidents across the United States each year. Accordingly, it is important to understand what distracted driving is, how distracted driving accidents can be prevented, and how to protect your recovery if a distracted driver hurts you. All cell phone use for new drivers. Using a GPS or map. Changing the radio station or other music. Changing a portable DVD player. Listening to an audio book, podcast, or radio program. Adjusting the heat or air conditioning. Reading, doing work, or studying. Reaching for something on the floor or another seat. Of course, it is almost impossible to make a complete list of all possible distracted driving behaviors because a driver is distracted any time his hands leave the steering wheel, his eyes leave the road, or his attention is taken away from driving safely. On the road, every second counts. It takes an average of 2.9 seconds to answer a ringing cell phone and 4.6 seconds to read or send a text message. Less than 5 seconds may seem like a small amount of time, but these few seconds are all it takes to cause a Wisconsin distracted driving car crash. In just 2.9 seconds, a car traveling at 40 mph moves 58.7 feet. At 60 mph, the car moves 88 feet per second. 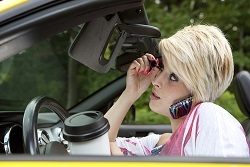 If a driver answers the phone at 40 mph, he will travel 170 feet before he next looks at the road. At 60 mph he will travel just over 255 feet. A child suddenly ran into the street? Another driver made a sudden stop? The semi-truck in front of you slowed down during those few seconds? You may not notice in time. You may not even have time to slow down before impact, and you may cause a serious or fatal crash. Avoiding driving when upset, tired, or angry. Putting an outgoing message on your phone that indicates you are in the car and when you expect to reach your destination. Appointing a designated texter. Allow a passenger to answer your phone and read your texts to you, if a passenger is available in the car. Putting your phone in the back seat or trunk so that you are not tempted to look at. Informing your boss, your office, your spouse, your parents, and those who care for your children that you do not answer the phone while driving and make sure that they have a backup plan in place in case you are unreachable. Being patient with yourself. Remember that just a few decades ago it would not have been possible to reach you if you weren’t home. Realize it is okay to be out of communication so that you can concentrate on driving safely. Recognizing that if a true emergency arises and you need to place an outgoing phone call or text, then it is important to pull over to a safe spot before picking up your phone. Additionally, as a community we can work to avoid distracted driving accidents and to save lives. The law firm of Hupy and Abraham is distributing free “DNT TXT N DRV” bumper stickers. We are dedicated to raising awareness to the dangers of distracted driving and reminding everyone to focus on the road while driving. The results of a distracted driving accident can be devastating. If you have been hurt, or a loved one has been killed in a distracted driving crash then you need to take action to protect your rights and your potential recovery. Your recovery could include compensation for past, current and future medical expenses, lost income, out-of-pocket costs, pain, suffering and other damages. However, first you will need to establish that the distracted driver caused your injuries. If you would like help doing that then please contact us via this website to schedule a free consultation with an experienced car accident attorney. Is That Burger Relevant to Your Car Accident Case?